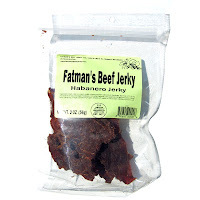 The next of the newest flavors from Fatman's Beef Jerky is this Habanero variety. See my reviews of their other flavors. Beef, water, soy sauce, worcestershire sauce, vinegar, habanero powder, salt. The first thing I taste from the surface of these pieces is a meaty flavor, followed by a light bit of habanero burn. A little bit of saltiness comes in later. The chewing flavor starts with strong natural meat flavor. The habanero burn builds up more, as does the saltiness. For being advertised as a "Habanero" beef jerky, it definitely has a good deal of heat. On my personal hot scale, I'd rate it as medium hot. It's enough to warm up my blood, and make my scalp feel a little prickly. But not so hot that I can keep eating this stuff without pausing. But I don't really taste the unique flavor of habanero chiles. What I taste the most of is the natural meat flavors. Like with Fatman's other jerky flavors, it has that taste that reminds me of the center portion of prime rib, almost like roasted beef too. Some of these pieces have some marbilization which seems to add some additional fatty flavor. The saltiness in this seems moderate overall. The soy sauce and worcestershire sauce ingredients are hardly noticeable on their own, but seem to enhance the natural meat flavors and adds to the moderate saltiness. Overall, it's a simple tasting jerky of mostly the natural meat flavors and a moderate saltiness, but a good deal of heat from the habanero powder. This is a dry jerky, with a dry surface feel. They have a light amount of flexibility, but will crack open easily. The pieces are easy to tear apart with my fingers, and chewing is slightly labored though still easy overall. The chewing texture starts out feeling dry and chewy. This batch of jerky doesn't have the light amount of crunchiness that I found in most other of Fatman's varieties. This jerky seems to chew down to a soft mass relatively easily and by that time it has a steak-like feel, comparable to one cooked well-done. I don't see any visible signs of fat aside from streaks of marbilization. I don't find any gristle or tendon. There's also a small amount of stringiness noticeable when I tear pieces apart, but they don't show up much in the chewing. 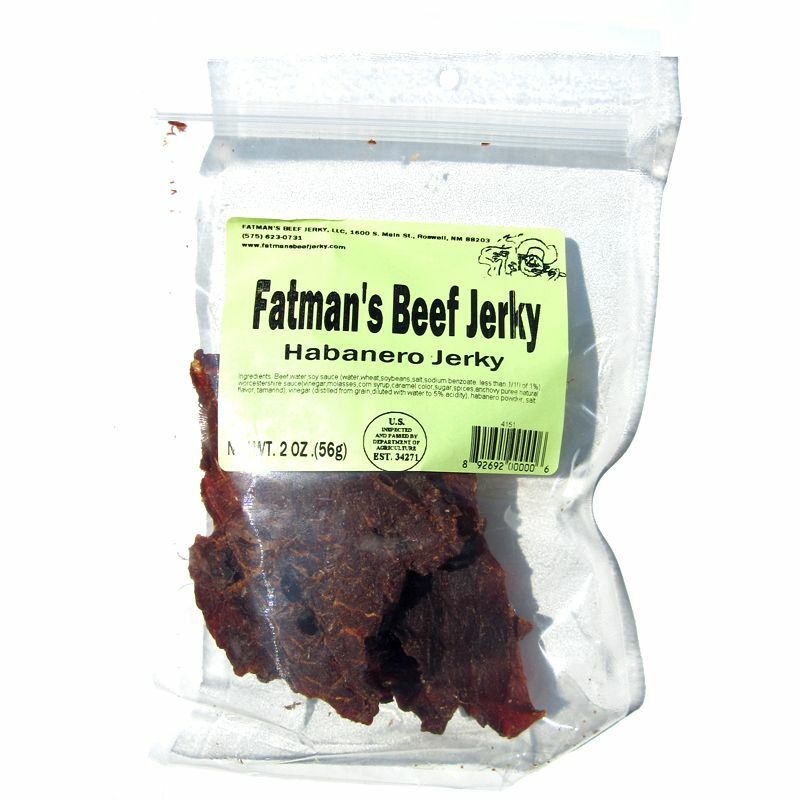 Fatman's sells this Habanero Beef Jerky from its website at a price of $28.00 for a 1 pound package. Add to that shipping fees of $5.15 (if shipping to Southern California), for a total of $33.15. That works out to a price of $2.07 per ounce. For general jerky snacking purposes at the $2.07 price per ounce, it seems to provide a decent value. I'm getting an average amount of snackability for a decent overall flavor, good meat consistency and chewing texture. That price is slightly above what you'd pay for major brands of jerky at grocery stores, but it seems to provide a comparable snackability. As a Habanero beef jerky at the same $2.07 price per ounce, it's a decent value as well. I get a good deal of habanero heat, more than what I'd get from the major brands of jerky, but I don't really get any habanero flavor. This Habanero variety from Fatman's Beef Jerky provides a good deal of heat, enough to register a "medium hot" (level 4 out of 5) on my personal hot scale. But it doesn't really provide any habanero chile flavor. And that's what I really like in chile flavored jerky, the unique flavor of chile peppers. 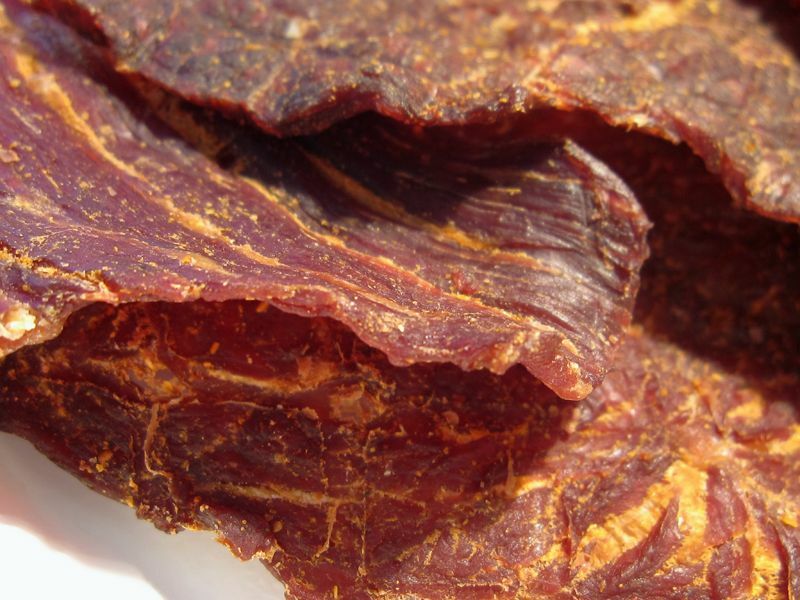 Otherwise this jerky comes off tasting rather simple, mostly a strong natural meat flavor, and a moderate saltiness. 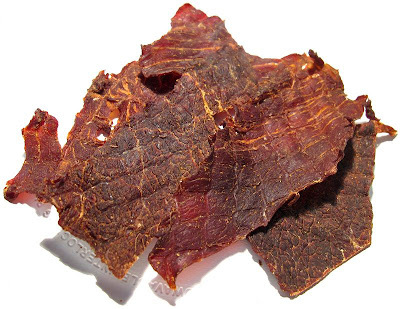 But for a dry, thin sliced jerky, it has a great meat consistency, just a little chewy, but still easy to tear apart and eat. There's a nice light fat marbilization in this review sample that added to the meat flavors. On a side note: the habanero powder on the surface of these pieces made me cough because when I put a piece into my mouth my breath inhaled them and they stuck to the back of my throat. My recommended beer pairing for this, go with something malty, like a barley wine. Try the Lagunitas Gnarley Wine or the Stone Old Guardian. I agree with a few things in your review, but where you seem to see them more as a negative, I see them more as a positive. My preference is to have a simple tasting jerky. To me, the meat flavoring should come first and the seasonings should suppliment. It's true the flavor of habanero peppers could show a little more face, but it's there, just a very subtle. The heat was adquette. It's not going to make chile heads burn up but if you have a high heat tolerance such as myself you'll be more than satisified. My biggest complaint is it seems a little too dry. When it's sliced as thin as it is and as dry as it is, it tends to be a little brittle. Overall, I feel it is above average jerky and wouldn't mind buying it from time to time. I ordered another bag of this jerky to give it my consistancy test (see if the quality is the same the second time around). I must say, I am very pleased with this batch. The flavoring of the habaneros is much more noticable this time around. The heat is about the same, which is good. My complaint with the last batch being too dry and brittle has been resolved in this batch.